There are multiple ways to get into wave lift: you can tow directly into it; you can climb in the rotor before pushing into the wave; you can thermal into wave; and you can enter the wave from another ridge downwind. It is usually not possible to enter the wave from the trigger ridge. How do I tow into wave? The easiest – although perhaps least satisfying – way to get into wave lift is to tow right into it. However, unless the local topography is such that the flight path on tow takes you around the wave area and the associated rotor turbulence, you have to be prepared for a challenging ride through the rotor. Towing into wave around the rotor. Most likely, towing around the wave area will not be practically possible. In this case it is best to avoid the areas directly underneath rotor clouds in order to keep out of the most turbulent air. Towing into wave by flying through the rotor zone. Expect the flight through the rotor zone to be very bumpy. Straps must be worn very tight to avoid hitting the head on the canopy, and all items in the plane must be secured. Staying in position behind the towplane is likely impossible and full rudder and aileron may be needed to counteract turbulence. Actively use slip techniques to avoid and correct slack in the tow line as much and as early as possible. Always keep safe landing areas within reach because the tow rope may break or you may be forced to release early. If flying at the altitude of nearby rotor clouds keep in mind that such clouds could form very quickly around you. How do I use the rotor to soar into wave? The air in the rotor zone is usually very turbulent with rapidly changing updrafts, downdrafts, as well as horizontal wind gusts. However, on the upwind side of the rotor there tend to be more updrafts than downdrafts and on the downwind side of the rotor there tend to be more downdrafts than updrafts. To get into wave using the rotor it is therefore necessary to climb on the upwind side of the rotor zone. Where to fly is easier to see if the rotor is marked by clouds. When approaching the rotor zone from the downwind side it is often best to fly around the area marked by the rotor cloud instead of flying straight through the downwind zone where there strong sink must be expected. Approaching the rotor zone from the downwind side. The techniques to use in order to climb in the rotor zone vary based on the distribution of lift and the strength of the wind. Sometimes it is sufficient to fly along the upwind side of the rotor zone; sometimes it is possible to fly figure eight loops similar to flying in ridge lift; and sometimes it is necessary to circle within the best bits of lift. Very narrow turns with steep bank angles may be required to stay in lift. Remember that the rotor tends to remain static relative to the terrain and that it is important to stay on the upwind side and avoid drifting to the downwind side of the rotor where there is mostly sink. That means that frequent corrections will be needed, especially when circling. If the lift is lost or strong sink is encountered, one should always probe again further upwind – chances are that the glider has drifted to the downwind side. This is particularly important when there are no clouds and one cannot be certain about one’s location relative to the rotor. In all cases it is advisable to try to climb as high as possible in the rotor before pushing into the wind to connect with the smooth wave flow. How do I use thermals to soar into wave? As discussed in the chapter about interference between wave and thermals it is possible that thermals form underneath the crest of the wave. The smooth wave flow will then be directly above the top of the thermals. If the thermals are marked by clouds their appearance may indicate a mixture of convective lift and rotor air flow. E.g., the base of a cloud may be flat or concave – indicating thermal updrafts, while its edges may appear ragged, especially on the upwind side and with curl-overs at the top – indicating rotor turbulence. If the wavelength is relatively long it is possible that multiple thermals form underneath a single wave crest. In this case, the strongest lift will likely be directly below the crest because that is where the convective layer is the deepest, the air is the most unstable, and the surface winds are relatively light. Multiple thermals forming underneath a wave. The strongest lift is likely directly below the crest of the wave air flow. Even though the wind may be relatively light there will still be wind drift while circling underneath these thermals. It is therefore possible that upwind corrections are necessary to stay within the area of the strongest lift. One should climb all the way up to cloud base and then begin to head upwind, push through the turbulent rotor area, and connect with the smooth wave flow on the upwind side. The higher the cloud base, the easier the wave entry is likely to be. In fact, wave entry can be easiest in blue conditions (apart from the fact that it may be difficult to locate the position of the wave) because in this case it is possible to climb to the very top of the convective layer. At the top of the climb the air will become turbulent. This is an indication that its time to push upwind to connect with the smooth wave airflow above. On the other hand, if the cloud base is very low relative to the wave flow (e.g. if it is just above the bottom of the wave flow), it may be very difficult or even impossible to gain sufficient altitude below the clouds to connect with the wave. To make an attempt it will be even more important to stay immediately below cloud base when pushing upwind towards the wave. The rotor zone will be at the upwind side of the clouds and it will be important to preserve altitude and pull up in every bit of rising air while pushing upwind through the rotor zone to preserve any chance of connecting with wave lift. How do I enter wave from a ridge? The existence of wave lift was accidentally discovered when Hans Deutschmann and Wolf Hirth pushed their Grunau Babys on March 3, 1933 upwind from the local Grunau ridge only to find themselves in a strangely smooth lift, the origins of which was a complete mystery to them. Ridge soaring into wave is only possible from a ridge that is located downwind of the wave trigger and happens to be “in phase” with the length of the wave. In the case of the Grunau ridge, the trigger was the lee slope of another mountain, the Riesengebirge, located about 12 miles upwind. To get into the wave you climb the downwind ridge as high as possible, then push into the wind and connect with the smooth wave flow. 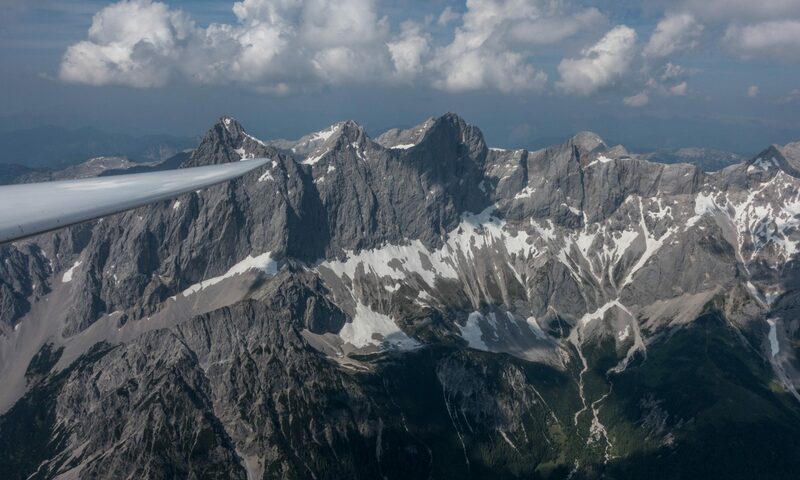 The air along the ridge will likely be more turbulent as usual, so its even more important to maintain a safe flying speed and a safe distance from the terrain. Entering wave from the upwind slope of the trigger ridge itself is usually not possible because the sink on the lee side tends to be so strong that the glider is on the ground before it can connect with the rising air flow. In addition, the trigger ridge is often shrouded in clouds and unsoarable.